I've been having a great time bringing my show to Perth, where the lovely friendly Australian audiences are nearly as warm as the weather. On Saturday friends took me to see Aussie rock legend James Reyne in Freemantle. He played all his own songs - no covers. Then halfway through he stopped singing for brief bit of audience banter: a joke about a funeral wreath in the shape of a lifebuoy which I instantly recognised the gag as being written Gary Delaney, a top quality professional UK comedian who writes deliciously clever one-liners. It was a bit odd travelling 9,127 miles across the globe to hear a rock legend telling one of my friend's gags. Now that's OK isn't it? James reciting someone else's work? Well I guess so and I'm sure that every Saturday night bars across Oz have amateur bands belting out cover versions of James Reynes' songs that he used many creative juices penning - without coughing up an single Australian dollar in royalties. However, what happens when it's professional comedians stealing jokes written by other professional comedians? Surely then there's a case to answer? Now, comedians these days write their own jokes - which are technically classed as 'intellectual property' (although to date I can't think of a lawsuit whereby someone has collected back royalties from a stolen joke). It would be very messy trying to prove the originator and indeed proving just how creatively original that 'original' joke is. Obviously there are no joke police (although I'm ideally qualified to take on that role) but joke thievery by fellow comedians is frowned upon. After all, a comedians' jokes are their currency with which they pay their bills. Once they are stolen, it can affect their ability to earn an income. That might sound far-fetched but if Peter Kay stole one of my jokes, and put it on his Christmas DVD, every time I subsequently tried to tell that joke on stage half the audience would finish the joke for me and the other half would shout 'that's Peter Kay's joke!' That means I could never tell my own joke again, preventing me earning an honest crust - effectively stealing the garlic bread from my mouth. Anyhow, back to Keith 'The Thief' Chegwin. He seems to have taken joke stealing to a new level, and has surely overstepped the mark, by producing an app via which he will sell you his jokes. 'His' in this case meaning old gags that belong on Antiques Roadshow and some newer ones stolen from professional comedians' current Twitter feeds. [Although the 99p app went free after an outcry]. I mean if Cheggers is allowed to get away with it, and there's no copyright protection for original creative comedy writing, then what's stopping me cutting and pasting Iain Duncan Smith's Welfare Reform Act and selling it to Kim Jong-Un? Anyway back to my own exciting career news and I'm very pleased to report the launch of my brand new character act who will be called 'Kieth Chegwin'. This pic is what I look like when I'm made up as 'Kieth'. PS. 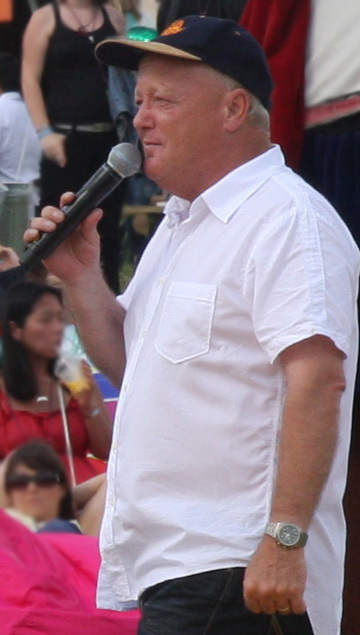 In case you were wondering - the picture is actually of Keith Chegwin by Paul Williams – and he puts his shot online under a Creative Commons Licences, meaning he's given permission for it to be shared with attribution. That's how you credit the 'originator', Cheggers.